This photo was taken on April 14, 2017 at 7:47 AM. The "Take It!" took no thought at all. It was as if I was a bystander in the process of recognizing how almost perfect this bit of spilled tar had formed into a small reptile. The remainder of taking out my camera and taking the single photo was like I was on some sort of automatic pilot. The After Take: has been splendid. I showed it to a number of people, that I had stated in advance the label chosen for the photo, and found when I presented the camera viewing screen several responded as if they were looking at a real snake. I had to remind them that it was made of tar. 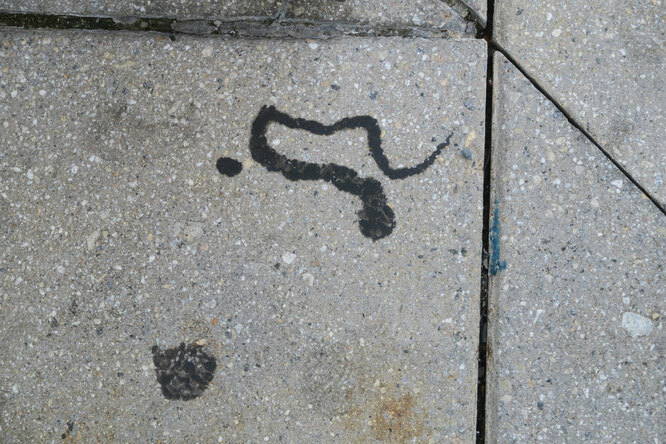 The dreaded gunk viper from the infamous sidewalk jungle. Good catch! They are indeed rare...and deadly if caught in heat. It's working its way toward that gum. Lol it really does look like a snake, good one! I wonder how many people have had to do a double take when they saw that.